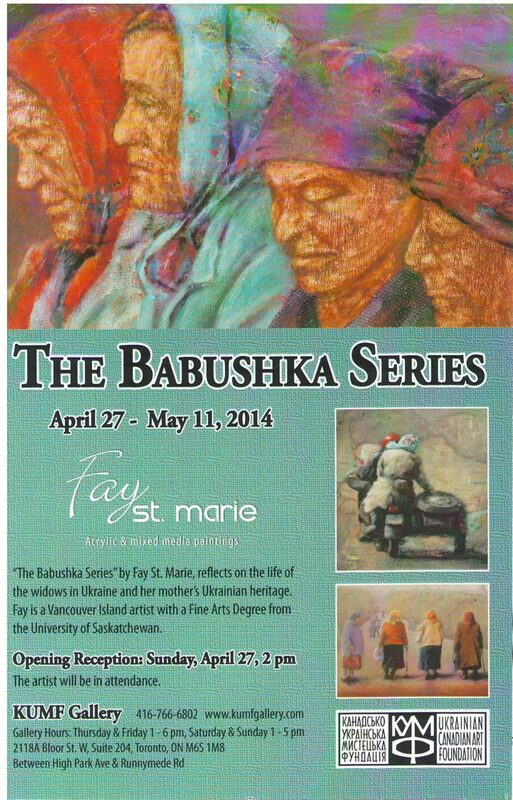 Opening: Sunday, April 27, at 2 p.m.
“The Babushka Series” by Fay St. Marie, reflects on the life of the widows in Ukraine and her mother’s Ukrainian heritage. This exhibition is a continuation of two successful solo shows in the past three years; in Saskatoon, SK and Qualicum Beach, BC. The paintings of the widows and of the countryside of Ukraine are a result a two week mission trip in the fall of 2008 to Nikopol and its nearby villages in Ukraine. Fay is a Vancouver Island artist with a Fine Arts Degree from University of Saskatchewan.